"As a newcomer to Canada with no friends or family, Red Door Shelter was truly a blessing for me and my daughter. I don't know know what I would have done without the Red Door's support"
Counselling, life skills training, and a host of other supportive services all provide the emotional and psychological support our residents desperately need when they come to our shelter. The Red Door maintains good relationships with service providers, such as lawyers, doctors, psychiatrists and other professionals, who can give the holistic support needed to help our residents heal and ultimately meet their goals. During their shelter stay, we continue to offer programs to support families, such as individual counselling, workshops and peer-support groups. The weekly meeting nights and workshop activities give residents a sense of collective peace and constant reassurance. In addition, our legal and court support referral services step in to provide women and families with practical and timely assistance with their legal issues. This includes liaison and advocacy with landlords and accompanying women to court when the prospect of facing one’s abuser seems too daunting to do alone. Support for children and youth is absolutely vital, because children and youth are the most vulnerable casualties of homelessness. Taking care of a child’s emotional and psychological well-being is, therefore, a high priority at the Red Door Shelter. 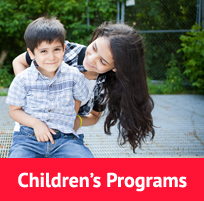 Our child and youth programming focuses on healthy childhood development and education. On any given night at the Red Door, over 50% of our residents are children. Our aim is to ensure that everyone is taken care of upon arrival and during the length of their stay at the Red Door — mind, body and soul.